Skiing got of to an early start in Warren County this winter, with Hickory Hill opening Dec. 22 and Gore Mountain on Dec. 26. Harvey Mountain, also North Creek, was expected to open momentarily. Gore Mountain Ski Club reported a four to twelve inch base Wednesday with slopes good and trails fair. With any snowfall at all during the weekend, skiing will be fair to good. Hickory Hill reported a six inch base and described skiing as fair to good. (North Creek) W. of Warrensburg, just N of Rt. 28 at North Creek. T-bar 3200′, 2 Ropes; 2 slopes, 5 trails, 50 acres of skiing. Chalet, snack bar. Hours: 9-4:30. Lift Fees: $4. Information: North Creek Ch. of Comm., Box 435 Ph. 3525. 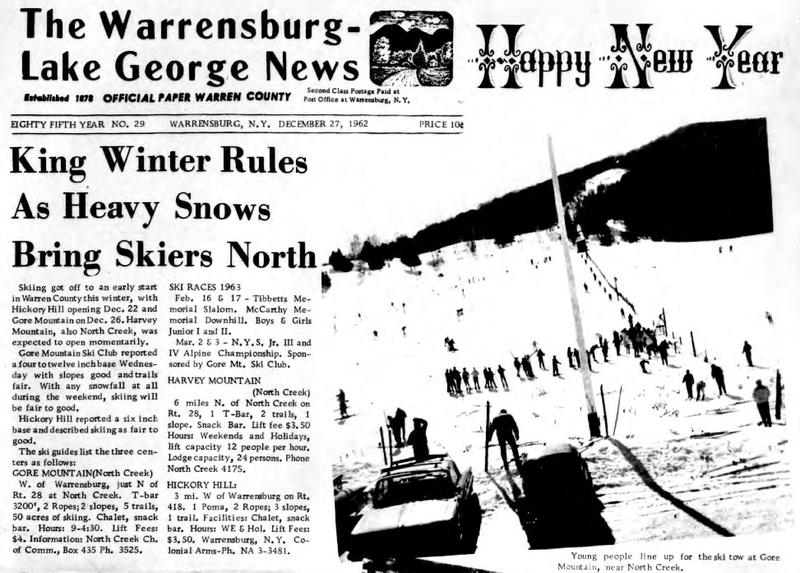 SKI RACES 1963 Feb. 16 & 17 – Tibbetts Memorial Slalom. McCarthy Memorial Downhill. Boys & Girls Junior I and II. Mar. 2 3 – N.Y.S. Jr. III and IV Alpine Championship. Sponsored by Gore Mt. Ski Club. (North Creek) 6 miles N. of North Creek on Rt. 28, 1 T-Bar, 2 trails, I slope. Snack Bar. Lift fee $3.50 Hours: Weekends and Holidays, lift capacity 12 people per hour. Lodge capacity, 24 persons. Phone North Creek 4175. 3 mi. W of Warrensburg on Rt. 418. 1 Poma, 2 Ropes; 3 slopes, 1 tra I I. Facilities: Chalet, snack bar. Hours: WE & Hol. Lift Fees: $3.50. Warrensburg, N.Y. Colonial Arms-Ph. NA 3-3481.